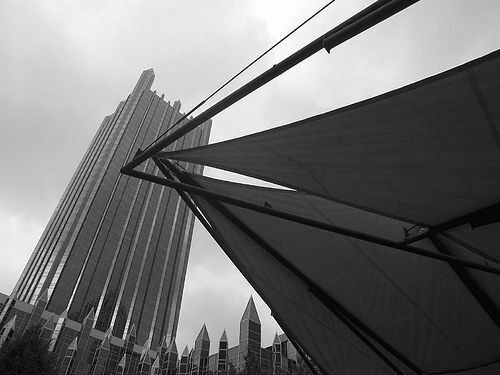 PPG Place in Pittsburgh is a dazzling skyscraper and plaza complex that houses shops, restaurants, a glass-enclosed event space and ice rink. It also has a stringent no photography policy. After hearing numerous complaints over the years, a couple of writers from The Globe, the paper of Point Park University, decided to challenge that and brought their cameras to the plaza. They were indeed approached by security and asked to leave. Puzzlingly, they were even told they could only take photos at eye level, not looking up. When they asked why, another guard gave the usual: ““Since 9/11, they don’t want people taking pictures here. You know what 9/11 is, right?” Right. It’s a public space. They treat it as such,” Rolinson said. “The Constitution says there is no expectation of privacy in public because it is a public place, and people should be allowed to take pictures there. We will not prohibit that Kodak moment; we have never prohibited that at PPG. … We have eased up on photography, but not to the point where we would allow it. Memorial Day I was walking down Liberty Avenue shooting pictures. Because of the impending storms, there were some really cool reflections of Midtown Towers and EQT on the surface of Two PNC. I’m on the sidewalk, and this security guard comes running out of Two PNC. “You’re not allowed to take pictures of the building.” “I’m not?” “No.” “Why not?” “Because of 9/11.” “This is still America.” “Just leave. And no more pictures of the building.” So she goes back into the building. I lift my camera and take a pic of her. That about says it all. If I didn’t have an appointment I was late for in Highland Park, I might have just been a little more defiant and kept on snapping. Unfortunately my picture of the old witch didn’t come out. Now I need to find out what security firm they work for so I can inform them that they need to provide their workers with some training. the conversation. Usually it is a result of the fire displayed in the post I looked at. And after this post The No Photo Policy of Pittsburgh�s PPG |. reply back as I’m looking to create my very own blog and would like to know where you got this from or just what the theme is named. It’s remarkable for me to have a web page, which is beneficial in support of my experience. to ask. Does building a well-established website like yours require a large amount oof work? I am brqnd new to blogging but I do write in my diary on a daily basis.